Natural gas prices on way up. It's time to find other sources of hydrogen for manufacturing fertiliser. Natural gas is used as a source of hydrogen in the manufacture of ammonia - to make fertiliser for farming. 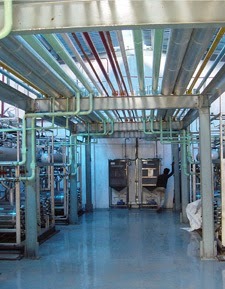 Natural gas is also used as a source of energy in manufacturing fertiliser. The price of natural gas is expected to double next year. This will lead to much higher costs to farming. Other sources of hydrogen for manufacturing fertiliser need to be found to keep farming costs in check. "Hydrogen from surplus wind energy." On August 28, 2013 E.ON inaugurated commercial operations at its Power-to-Gas (P2G) facility in Falkenhagen, Germany. The plant uses surplus wind power and Hydrogenics' electrolysis equipment to transform water into hydrogen. The facility which has a capacity of two megawatts produces 360 cubic meters of hydrogen per hour. "Hydrogenics units have been adapted specifically to meet the requirements of higher capacity installation in excess of 500Nm3/h. Thanks to our standardized approach, we can expand our capacities to meet your hydrogen demand, offering you additional redundancy and supply reliability. The hydrogen generator installation can be completed with additional options like a compressor system, online purity measurement and backup storage. Whichever setup you need, Hydrogenics will offer you a stress–free equipment to provide your process with a reliable supply of on-site hydrogen. When we talk about hydrogen generators at Hydrogenics, we want to deliver a safe and reliable unit the best you can find on the market and the most competitive for that quality." With his speech "The Case for Change" on 23 April 2014 the Hon. 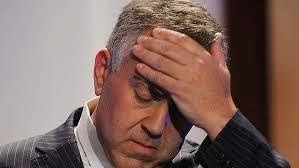 Joe Hockey MP Treasurer is quite convincing that Australians' interests will be well-served - by a change in Treasurer. Hockey: Living longer is a good thing if we have the wealth to support it. "Of course living longer is a good thing if we have the health to enjoy it and the wealth to support it. And it would not be an issue if those entering their post-work years had the resources to support themselves. But increasingly the burden of our ageing is being borne by other people. Of Australians over the age of 65, four out of five receive a full or part pension. If we also take into account the concessionary health card then only 14 per cent of older Australians receive no government payments. At least for the Age Pension, this situation is unlikely to be much different in 2050. Despite spending billions of dollars in taxation benefits for superannuation, by 2050 the ratio of Australians receiving a full or part pension will still be around four out of five." Hockey: Billions of dollars in taxation benefits for superannuation [produce no benefit]. Arguing that coal can be cleaned up, the coal industry proposed coal gasification with carbon capture and storage as the way to go. 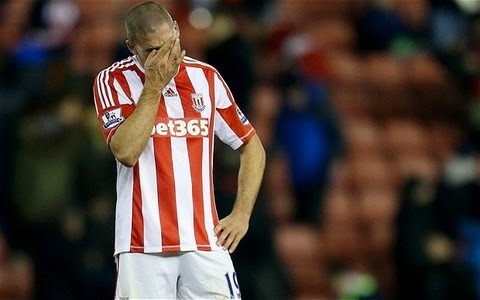 Jon Walters endured a torrid afternoon for Stoke City, scoring two own goals and missing a penalty. To cheer him up, here is the coal industry's own goal. The above video was made in 2008. Coal gasification power plants described in it - Tampa Electric's Polk IGCC Power Plant near Tampa, Florida and Duke Energy's Edwardsport Generating Station in Knox County, Indiana - are operating profitably in the United States. To the coal industry these two power plants must be "inconvenient facts": they demonstrate that the coal industry can retain a role in supplying fuel to power plants that meet new EPA emission standards. However now that China is getting on with this approach, the coal industry has suddenly got cold feet. A reason for this odd behaviour is that the coal industry realises that this technology promises to dramatically reduce the demand for coal. Even worse, it also threatens the slash demand for natural gas and shut down the fracking and coal seam gas industries. The result of continuing use of this technology will be a global glut of both coal and natural gas - causing substantial price falls, falling revenues and mine closures. GreatPoint Energy produces clean, low cost natural gas from coal, petroleum coke, and biomass utilizing its bluegas™ catalytic hydromethanation process. GreatPoint Energy's coal gasification technology appeals to China because it allows them to keep using cheap domestic coal, but in a much cleaner manner. In 2012, GreatPoint announced a $1.25 billion deal to build the first of 34 coal gasification plants in a remote, coal-rich part of China. The total project will cost an estimated $20 - 25 billion and will supply one trillion cubic feet of natural gas a year. This represents a massive leap in the scale of domestic production for China, which last year produced only 107 billion cubic feet of natural gas. The deal includes an equity investment of $420 million, the largest ever by a Chinese corporation into a venture-capital-funded U.S. company. The coal lobby has launched a misinformation campaign attacking the environmental benefits of coal gasification. This attack includes a deceptive study and a series of media releases. To the coal lobby it is predictable that the environmental movement will be quick to accept at face value what looks like a gift with which to attack the fossil fuel lobby. However it is worth taking a closer look at why the coal lobby is trying to discredit the technology it has proposed. Electricity can be generated far more efficiently from natural gas. Given this fact, construction of ANY coal-fired power station will now be a waste of money. A gas power station fueled by natural gas will ALWAYS be a better option. Fracking and coal seam gas are far less commercially viable. Given the fact that natural gas can be produced from coal, there is NO LONGER ANY NEED for the fracking and coal seam gas industries. Considering these benefits, and the detriment they cause to both the coal and natural gas industries, it is easy to understand the coal lobby's misinformation campaign against its own proposed technology. A good example of the misinformation created by the coal lobby is in a recent article on the climate science deniers' misinformation website, The Global Warming Policy Foundation (GWPF). The relevance of this article to The Global Warming Policy Foundation is not as obscure as it first appears. As a vehicle to spread misinformation to further the coal lobby's interests, it makes as much sense for The Global Warming Policy Foundation to attack climate science as it does to attack a technology that likewise threatens vested interests of the coal industry. "Coal Gasification: The Clean Energy Of The Future?" "Dirty it may be, but coal is cheap. For this simple reason, it remains the world's main source of power, providing a quarter of our primary energy and more than 40% of our electricity. And it will continue to do so for many years to come. The challenge, then, is how to harness coal's energy more cleanly. While global attempts to develop carbon capture and storage (CCS) have stalled, a number of countries are looking at different ways to exploit their abundant coal reserves." "Not all are motivated by environmental concerns, but are driven instead by economics and a desire for energy independence." "The main technology being used is coal gasification - instead of burning the fossil fuel, it is chemically transformed into synthetic natural gas (SNG). The process is decades old, but recent rises in the price of gas mean it is now more economically viable. The US has dabbled in the technique, but China is going all out in a bid to satisfy its soaring demand for power and reduce its dependency on imported liquefied natural gas (LNG). The country's National Energy Administration has laid out plans to produce 50 billion cubic metres of gas from coal by 2020, enough to satisfy more than 10% of China's total gas demand. Coal gasification makes economic sense. Not only does it make economic sense, but it allows China to exploit stranded coal deposits sitting thousands of kilometres from the country's main industrial centres. Transporting gas is, after all, a lot cheaper than transporting coal. Coal gasification can also help address local pollution problems that have in recent months brought parts of the country to a virtual standstill." The coal gasification process China uses is EXACTLY what the coal lobby has long proposed as the pathway to clean coal. "But there are two big problems. First, coal gasification actually produces more CO2 than a traditional coal plant; so not only will China be using more coal, it will be doing so at a greater cost to the environment. As Laszlo Varro, head of gas, coal and power markets at the International Energy Agency (IEA), says: "[Coal gasification] is attractive from an economic and energy security perspective. 'It can be a nice solution to local pollution, but its overall carbon intensity is worse [than coal mining], so it is not attractive at all from a climate change point of view'." In reality China has adopted new efficient technology from GreatPoint Energy to convert coal to natural gas and carbon dioxide. This mixture is the same as that commonly encountered in raw conventional natural gas produced from gas wells. The gas industry has long-established technology to separate carbon dioxide from natural gas. As a result, the coal gasification process China uses easily separates a pure stream of carbon dioxide that is ready for carbon capture and storage or use in fertiliser plants... which is EXACTLY what the coal lobby has long proposed as the pathway to clean coal. The next step in our campaign to double energy productivity is to gather additional support for the Joint Statement on Lifting Energy Productivity and to engage government and businesses in developing an Australian Energy Productivity Roadmap. We will keep you informed of progress through these newsletters. Presentations from the 2XEP Forum can now be viewed online. Click here to view the video catalogue. We will feature some presentation highlights in the weeks ahead. Thank you to the dozens of people who have already provided feedback on the 2XEP Forum. We have also circulated an online feedback form to all delegates. For those who have not yet had an opportunity to do so, please send us your feedback so we can continue to improve our future events. Step 1. Tackle the largest part of your electricity bill. For many households and businesses this will be space heating and cooling together with water heating. Step 2. Keep the cost to a minimum. Using the same piece of equipment to perform several functions is one way to keep the equipment purchase cost and installation cost down. Step 3. Keep the running cost to a minimum. Aim to use a minimum of high-priced energy and use it mostly in off-peak periods when its price is likely to be discounted. A reverse-cycle air conditioner is just another name for a heat pump. Heat pumps use electrical energy to "pump" heat from one temperature to another temperature. Refrigerators contain a heat pump that "pumps" heat from the inside of the refrigerator to the outside. The amount of electrical energy a heat pump uses is less than the amount of heat it is able to "pump". On a cool day a heat pump in a reverse-cycle air-conditioner may be able to pump 5 kilowatt-hours of heat energy into your home to warm it up from the air outside using only 1 kilowatt-hour of electrical energy. On a very cold day it may only be able to pump 3 kilowatt-hours of heat energy into your home from the air outside using the same amount, 1 kilowatt-hour, of electrical energy. Heat energy can be stored in a "phase change material". This is any substance that melts, changing from a solid to liquid at some constant temperature, absorbing a quantity of heat energy while it is melting. Ice that melts to water at zero degrees Centigrade (32 degrees Fahrenheit) while absorbing heat energy is an example of a phase change material. The same phase change material solidifies at its melting point temperature - changing from water to ice - at zero degrees Centigrade (32 degrees Fahrenheit) while releasing heat energy. A quantity of a solid phase change material that melts while absorbing heat at say, 18 degrees Centigrade (64.4 degrees Fahrenheit) , can be used to cool a home or business office by absorbing heat during hot days. If the overnight minimum temperature is below 18 degrees Centigrade (64.4 degrees Fahrenheit) the phase change material can be cooled and solidified while releasing heat energy with no electrical energy being needed. It would then be ready to provide cooling the next day, again with no electrical energy being needed. To be reliable a heat pump could ensure the phase change material solidifies overnight on slightly warmer nights by "pumping" heat from the phase change material into the outside air. The amount of electrical energy needed to do this will be much less than pumping heat into the outside air when the temperature is much hotter in the daytime. The price of the electricity will hopefully be less overnight than during daytime hours. The heat pump should also be able to pump heat into the phase change material during the daytime from the air inside your home or business office to ensure reliable cooling. Very little energy will be needed to do this compared to pumping heat into the outside air during very hot days. An example of a system that does this is marketed by Phase Change Products Pty Ltd (PCP). There is an outline in the post "Having your air conditioner and low peak demand too". A quantity of a liquid phase change material that solidifies while releasing heat energy at say, 30 degrees Centigrade (86 degrees Fahrenheit) , can be used to warm a home or business office during cold days and nights. Even on cold days with a maximum temperature of 15 degrees Centigrade (59 degrees Fahrenheit), the temperature in a closed container that allows sunlight to enter can quickly warm to a much higher temperature. 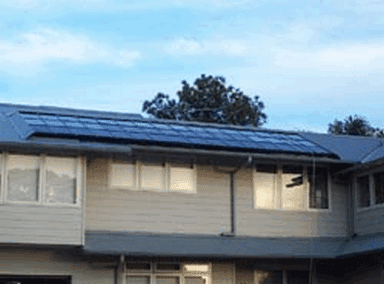 The Australian National University has developed a low-cost module that can double as both part of the roof of a home or business office and absorb solar energy at a temperature greater than the outside air temperature. Bluescope has recently unveiled a commercial roofing product that delivers this concept. The amount of heat energy that can be used from this solar thermal energy collector is greatest when the temperature of the air inside it is relatively low. As the absorber is allowed to heat up to higher and higher temperatures, an increasing proportion of the absorbed solar thermal energy is re-radiated back into the outside air. Eventually it reaches an equilibrium temperature at which the energy entering is equal to the energy being re-radiated. At this "stall temperature" no energy is available to pump into a phase change material - without lowering the temperature in the solar thermal collector. A heat pump is needed to reliably add heat energy to the quantity of phase change material from the solar absorber during sunlight hours. The amount of electrical energy needed to do this will be considerable less than what the heat pump would use to pump the heat energy from the much colder air outside your home or business office. To warm your home or business office overnight, a heat pump would need very little electrical energy to move heat energy from the quantity of phase change material that solidifies while releasing heat energy at 30 degrees Centigrade (86 degrees Fahrenheit). The same quantity of liquid phase change material that releases heat energy while solidifying that is used for space heating in winter can also be used for heating water in a hot water storage tank. A heat pump can pump heat energy from the liquid phase change material into the hot water tank overnight, taking advantage of the lower-price electricity available during off-peak hours. This will use less energy than a heat pump that was pumping heat from cold air overnight and be cheaper than pumping heat from warm air in the daytime when electricity prices are higher. A purpose-designed heat pump intended to perform each of the functions would provide the benefits of low capital cost and low installation cost. When being used to transfer heat to and from phase change materials it should be highly efficient for these small temperature lift applications. What an inspiring two days! Last week, 240 leaders from industry, government and research from the U.S, Australia and beyond gathered at the 2XEP Forum to focus on doubling Australia's energy productivity by 2030. Kateri Callahan, President of the U.S. Alliance to Save Energy, Heather Zichal, President Obama's Former Lead Advisor on Energy and Climate Change, and Hon Anthony Roberts MP, NSW Minister for Energy opened the Forum and set the tone for the forum discussions. Dozens of eminent speakers shared their experiences and insights on how their particular industries could lift energy productivity. Over the next few weeks, we will share with you links to some of the many very stimulating and informative presentations at the Forum. The 2XEP Forum was, of course, just the beginning of an energy productivity transformation for Australia. The next step in A2SE's campaign to double energy productivity is to gather additional support for the Joint Statement on Lifting Energy Productivity and to engage government and businesses in developing an Australian Energy Productivity Roadmap. If your organisation would like to support the Roadmap, please contact A2SE at info@a2se.org.au or call (02) 9514 3675. A big thank you to everyone who contributed, supported and attended the 2XEP Forum on Doubling Energy Productivity. To our attendees, we hope you found the event inspiring, informative and valuable. To our panel leaders and speakers, thank you for your contributions to our sessions and for sharing your insight and knowledge. To our sponsors and supporters, we could not have done it without you. Speaking at the 2XEP Forum, NSW Energy Minister Anthony Roberts MP commented on energy security being more than just securing supply; asserting the significance of innovative approaches to using energy more efficiently and the critical role the government must play in delivering this result. Minister Roberts also reaffirmed his Governments support for its pioneering Energy Savings Scheme and noted that the surge in electricity prices in NSW driven by network investment was at an end and that network capital expenditure budgets had been cut by $4.3 billion. A2SE was delighted to welcome Dr. John Hewson AM as our Forum Dinner speaker. The theme of his address was 'Productivity, Policy and Politics - creating a competitive 21st century in Australia'. In a wide-ranging, amusing and inspiring speech, Dr Hewson reflected on the challenges he faced throughout his distinguished career when trying to drive change in various projects and endeavours. Dr Hewson noted that the concept of lifting energy efficiency should be broadly appealing and achievable. Despite the inevitable hurdles in promoting energy efficiency, he encouraged his audience to be optimistic about winning the argument on energy productivity. * Videos of other 2XEP Forum speakers will be available soon.